The Vikings’ moves at the NFL’s roster cutdown deadline on Sept. 1, when the team released 35-year-old defensive end Brian Robison and shifted 40-year-old Terence Newman to its coaching staff, put a youthful sheen on the 2018 roster even as the Vikings try to chase a championship. In fact, as the NFL’s roster data showed on Wednesday, it made the Vikings’ roster the youngest in the NFC. The league released a set of metrics for all 32 teams’ rosters as of Week 1, and the Vikings’ average age of 25.47 years gave them the NFC’s youngest roster, as well as the third-youngest roster in the league (behind only Cleveland and Cincinnati). The Vikings had just four players who were 30 and older as of kickoff weekend, which ties them for the second-fewest thirtysomethings in the conference (Dallas only has two players in their 30s, and three AFC teams have three). 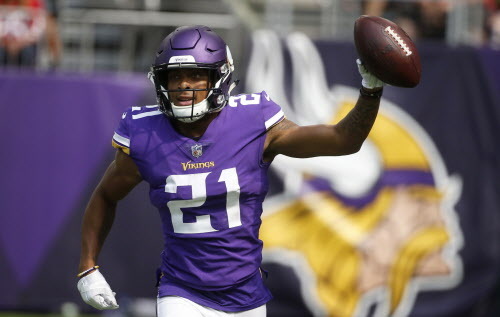 Eleven players on the Vikings’ roster are rookies or first-year players, which puts them just above the NFL and NFC averages of 10.38 and 10.31, respectively. Their average of 3.49 years of experience is also the lowest in the NFC, and the second-lowest in the NFL behind Cleveland’s 3.21. The NFL has put an emphasis on protecting QBs from late hits this season, stemming from Anthony Barr's legal hit last season that led to Aaron Rodgers' broken collarbone. The Vikings are one of three NFC North teams whose rosters are younger than the conference average; Green Bay has an average age of 25.74 years, while Chicago checks in at 25.77. –At an average height of 6.22 feet, the Vikings are tied for the tallest roster in the NFC with the Packers. Just Seven of the Vikings’ 53 players are under six feet tall. –The average player on the Vikings’ roster weighs 244.19 pounds, which is just below the NFC average of 244.72. There are eight players on the team’s roster under 200 pounds, and 11 over 300 pounds. –Kirk Cousins, who was taken 102nd overall by the Redskins in 2012, is one of nine opening-day starting QBs who was taken 75th overall or later. He joins New England’s Tom Brady, Buffalo’s Nathan Peterman, Cleveland’s Tyrod Taylor, Dallas’ Dak Prescott, Seattle’s Russell Wilson and Tampa Bay’s Ryan Fitzpatrick in the group. Philadelphia’s Nick Foles — Cousins’ former teammate at Michigan State — is also in the group, as is Case Keenum, the undrafted free agent who preceded Cousins as the Vikings’ starting QB. Interestingly enough, there were more opening day starters taken 75th or later than there were No. 1 overall picks (seven).